Perhaps predictably, Louis van Gaal delivered the best line of the day as he reflected on how his side survived an early storm to beat Arsenal 2-1. 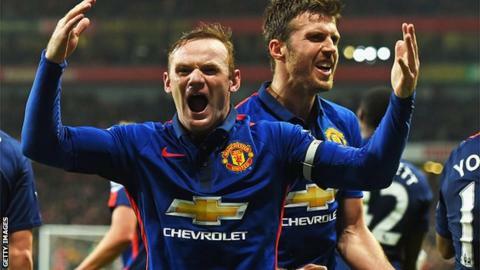 But there was nothing expected about the way his Manchester United side claimed their first away win of the season. "If Arsenal had scored in the first 20 minutes then it is a different game," said the United boss. "And then maybe I have to respond to all the questions asking why I chose the three centre-backs. But now I can laugh." The joke ended up being on Arsenal's attacking players rather than the unlikely trio of defenders that Van Gaal had picked - Chris Smalling, Tyler Blackett and Paddy McNair - who surprisingly held out until Olivier Giroud's ferocious strike in stoppage time. Saturday evening's defeat was not the same old story for the Gunners either - they did not take the lead this time, for starters. And while we already knew that both teams are unlikely to mount a title challenge, there were still things to be learned from a game billed as the battle for fourth place. It had taken United until the 85th minute to muster a shot on target, with Kieran Gibbs' bizarre own goal gifting them the lead before Wayne Rooney's late strike prevented the game finishing with that odd statistic. As well as his first away win as United boss, this was arguably the first win under Van Gaal that had been earned by his defence. Arsene Wenger was keen to point out that David De Gea was man of the match at Emirates Stadium but in truth the United keeper made a lot of saves he would be expected to make, rather than any truly outstanding ones. Or as Van Gaal put it: "Most of his saves were from outside the area and from that distance the goalkeeper has more advantage than the player shooting." The biggest reason De Gea's recently dislocated finger was not truly tested was United's makeshift backline, something few people expected to be saying before this game when they saw the team sheet with the names of Smalling, McNair and Blackett on it. A fourth clean sheet of the season looked even less likely when one of the wing-backs, Luke Shaw, was forced off after 16 minutes to be replaced by Ashley Young - who according to his manager is not fully fit. At that stage, Arsenal were rampant and it seemed a case of when they would score, not if. But instead of collapsing, United stood firm. Smalling, who is not viewed as natural leader, marshalled the youngsters either side of him. In front of them, Michael Carrick and Marouane Fellaini added much-needed bite to midfield. Together they earned Van Gaal a win that moved his side up to fourth in the table - something he seemed surprised about when he was told. Manchester United have lost only one of their last 15 matches against Arsenal in all competitions, winning 11. While United can - justifiably - claim to be making progress, the raw statistics demonstrate Arsenal are going backwards. A year ago, they beat Southampton 2-0 and were four points clear at the top of the table with 28 points from 12 games. Fast forward 12 months and Wenger's men have 11 points fewer at the same stage, and trail leaders Chelsea by 15 points. Yes, fourth place is still in their reach - United, in the last of the Champions League places, are only two points ahead. Framed like that, this campaign is not yet a disaster. But after ending their trophy drought by winning the FA Cup, and following that up with a summer of heavy investment, Arsenal fans can be forgiven for thinking their title challenge should have lasted longer than it did last season, when it faded in the New Year. Instead it is all but over before most people have put their Christmas decorations up. Some are making their frustrations heard - such as the Gunners fan in front of the press box on Saturday who held aloft a sign reading "Enough is Enough - Wenger out". But the majority remained with their manager on this occasion, perhaps because this defeat was unlike most of their setbacks this season. This time, it was misfortune that cost them the initiative in a game, rather than any ill-advised attempts to extend their lead. Gibbs' collision with Wojciech Szczesny that led to the full-back's own goal and ended the keeper's involvment in the game was pure farce. It would be unkind to compare the duo's actions to the antics of Jim Carrey and Jeff Daniels, the stars of new film 'Dumb and Dumber To' who were at Emirates Stadium to watch the game. But you get the feeling their characters Lloyd Christmas and Harry Dunne would definitely have approved. United's second goal was much more familiar to Arsenal fans, with their team being caught up the pitch and exposed on the break - but at least this time it was because they were chasing the game. Wenger's team have obvious shortcomings but they were not behind this defeat and his side did not get what they deserved against United. Instead it was just one of those nights.